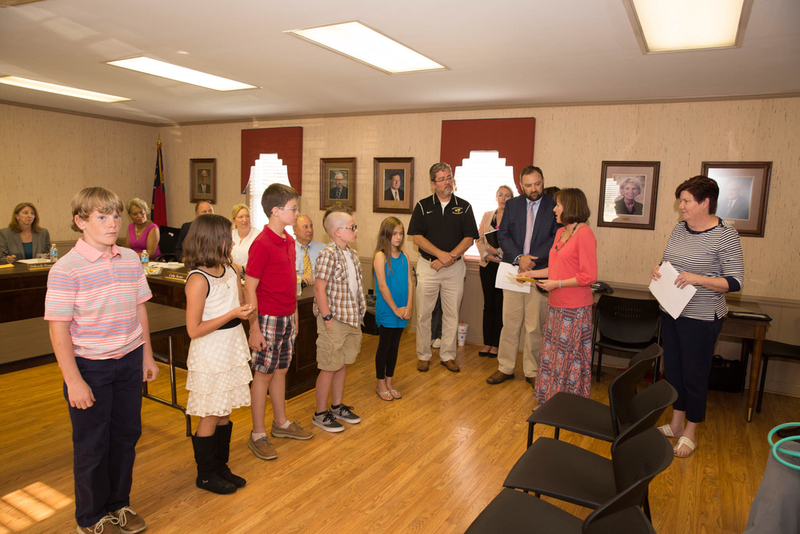 The Roanoke Rapids Graded School District Board of Trustees honored several outstanding students Tuesday night at its regular monthly meeting and accepted two grants. Five fourth grade students from Belmont and Manning Elementary were recognized as Word Masters Challenge Winners. The following students scored in the top 2% in the country in the vocabulary challenge: Bailey Cain, Austin Fender, Savanah Medlin, Reagan Taylor, and Seth Tickel. Superintendent Dain Butler, Board Chairman Jay Carlisle and Trustees also honored the district’s 2017-2018 Teacher of the Year Mary Durham, Principal of the Year Jeff White, Assistant Principal of the Year, Tad Merritt, and Support Person of the Year, Emily Harris. The district also received two grants to help students this summer and next school year. Belmont was awarded a $3,000 grant from Dominion Energy to facilitate the continued development for the Makerspace in the Media Center at Belmont Elementary School. In this exciting environment, students will be able to work on computer coding, audio visual programs, circuitry, robotics, small-scale engineering, woodworking, knitting/crafting, 3D printing, and other hands-on activities. More than 200 students will benefit this summer from an $11,500 grant from the Roanoke Valley United Way for the Elementary Summer Reading Camp. The grant will help provide supplemental supplies, parent resources, and aid in purchasing book packs for all camp attendees to take home at the end of camp on their instructional reading level. The camp will be held June 19-29 and July 10-20 at Belmont Elementary School.